Edward Cervantes A native Angeleno and former New Yorker, Edward Cervantes is proud to now be a resident of Oakland, where he lives with his partner Jim and their three cats. He is a candidate for a master’s degree in public policy at Mills College. 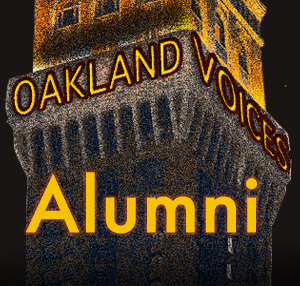 Fascinated by Oakland’s history, diversity, and geography, Edward looks forward to further exploring and writing about the city’s richness and complexity. Howard Dyckoff Howard Dyckoff has lived in Oakland for over 30 years and has been involved with many community groups, including Oakland Digital and Oakland Local, Block by Block and the East Oakland Boxing Association (EOBA). A New York transplant, Howard attended Laney College, where he wrote for the Laney Tower newspaper. He has served as the Berkeley Free Clinic’s Outreach Coordinator, and also worked as an information technology professional at Chevron and Wells Fargo. Howard has been a regular contributor to Oakland Local and online publications such as TechTarget and Linux Gazette. He currently does event photography around the Bay Area. Jian Di Liang Jian Di Liang (Charlotte) is from China. She is enthusiastic, friendly and outgoing. Meeting new people and traveling are her biggest interests. Katherine Brown Katherine Brown was born in Houston, and her family moved to Oakland when she was 6 months old. “I am fortunate to have a loving family and an amazing community of friends,” Katherine says. “I love to help others, which is fused into my life and work.” Katherine enjoys volunteering, dance, and sports, with football being her favorite. Ronald Owens Ronald Owens is a longtime Oakland resident who has lived in East Oakland’s Maxwell Park neighborhood for nine years.